Last year we seen the effects of La Nina with flooding rain from near hurricanes and severe storms that produced tornadoes in Central and Southeast US. La Nina has weakened and now we were facing drought like conditions. The National Weather service has been tracking a "Nor'easter" storm that has been projected to effect a large part of the Eastern US. In SE PA we will probably see around 2 inches of rain, but Northeast New Jersey could see 3.5 inches that may cause flooding in rivers and small streams. For months I have been preaching about protecting the National Weather Service from proposed budget cuts. I even sent around a online petition I found to send the message to the White House and congress about this. Today I found a story online at washingtonpost.com that basically states that a bill has been approved to shift funding for building satellites from NOAA to NASA. The Subcommittee’s bill prioritizes activities that save lives, protect public safety, and foster job creation in the private sector. The Subcommittee placed a high priority on ensuring accountability of taxpayer funding and reducing duplicative activities. As a result, the Committee has chosen to make a major shift in how next generation weather satellites are purchased, shifting responsibility for satellite acquisition from the National Oceanic and Atmospheric Administration (NOAA) to the National Aeronautics and Space Administration (NASA). A summary by Department appears below. Department of Commerce – The fiscal year 2013 CJS bill provides $6.3 billion total, which is $1.5 billion below the fiscal year 2012 level.  National Oceanic and Atmospheric Administration (NOAA) – The bill provides $3.4 billion for NOAA, which is $1.47 billion below the fiscal year 2012 enacted level. The bill does not support proposed cuts to NOAA’s operations that would hurt local communities, such as eliminating local weather forecasting staff and reducing the U.S. Tsunami Warning Network. Instead, the committee finds financial savings by consolidating management offices and reducing government overhead. The bill transfers funding needed for weather satellite acquisition from NOAA to NASA, resulting in a savings of $117 million in fiscal year 2013. Remember that the National Weather service is part of the Department of Commerce..
Everyone remembers watching the news last year hearing of multiple tornadoes striking different parts of Central and South East US. Many of these storms were not just witnessed by residents, but by filmmakers and weather experts. 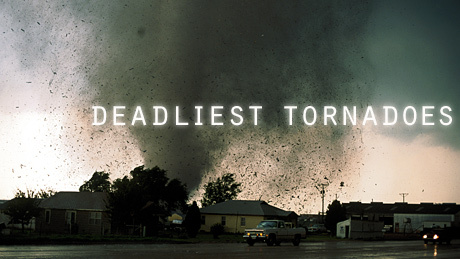 NOVA has produced one of the best Tornado documentaries I have ever seen, explaining both how tornadoes are currently detected and what is being done to study and prepare using new technologies. Here is a short preview of this great program and below that, the link to see it from the source. FEMA, also known as the Federal Emergency Management Agency, an organization that assists the general public to inform and protect from domestic disasters whether they are natural or man made. READY is a campaign started in 2003 to organize and involve citizens to prepare for disasters using many different forms of public resources and communications tools such as the internet and cell phones. I found that anyone with a cell phone can easily subscribe to FEMA's text messaging system. The following is from the http://www.ready.gov/get-tech-ready website. Now you probably ask, why do we need information from FEMA. Remember last year when our area was hit by flooding from Tropical Storm Irene? Well when you see there is a forecast for significant rain, you will be better prepared for floods and storms in general to help you, your family, co workers and friends. Here is another link to the ready website for more information to being prepared, such as a preparing a plan for emergencies and being ready for a flood. The National Weather Service issued a report showing that there were 124 confirmed tornadoes that caused havoc on April 14th, 2012. The image below was posted with the damage information from www.weather.com website. I participated with a storm chaser group online to help post storm alerts through the day from the NWS. Tornado radar signature from 9:27 pm to 10:41 pm CDT Saturday April 14, 2012. Conventional radar reflectivity is at left, storm-relative Doppler velocity is at right. Tornadic circulation is denoted by yellow circle at right.as it passed over west side of Woodward, Okla.
5 casualties, 29 injured and 89 homes destroyed. If you remember who Tim Samaras is, he was featured in the TV show "Storm Chasers' on Discovery. Below is a video I found that shows a lot of detail and an impressive close up shot of a tornado. Please note, that this type of filming should only be done by the experts, who have spent years studying storms .